Owners and riders alike understand the importance of taking proper care of their arena. They also understand how expensive and time-consuming arena maintenance can be. Quality drag equipment is crucial when it comes to taking care of your arena. Choosing the right one is of utmost importance, and Red Master Harrow in Amarillo has the best equipment to fit your needs. A ripper attachment — The Red Master T-Rex's ripper attachment is what sets it apart from all other harrows. Other arena tools use a fixed ripper in which you have to tilt the complete unit to change the angle. With the ripper attachment, however, you can use the top link to the harrow to make it as aggressive or nonaggressive as you need. Gauge wheels — The T-Rex's gauge wheels are designed to maintain a level cutting surface while riding along the arena's surface. S-Tines — Two rows of offset s-tines are controlled by a top link set from 1-8 inches in depth. The s-tines loosen up clods while fluffing the soil by adding extra air to it. Paddle wheel — The paddle wheel located at the rear of the unit is used to break clods and to add more air to the soil. It's designed to float on the ground and allow clods to roll under the unit instead of locking up or dragging dirt. Float pan — The T-Rex's float pan smooths the ground while locking air into it. Whether you are a knowledgeable tractor operator or not, the Red Master Harrow is made for you. It maintains a level surface while giving you total control of the working depth of air pockets. It's good for both winter and summer use (most harrows don't do both). Other features include three tire height adjustments, a three-point lift that allows operators to back into corners, and a float pan that compresses the surface to ensure consistency. Designed for facilities without a tractor, the Mini Red works with any utility vehicle, including a Gator, Mule or a 4-wheel all-terrain vehicle. It comes with an adjustable float pan and provides uniform consistency to the soil. The Red Master Roller offers the ultimate in all-season maintenance and enables you to control the air pockets for wet to dry versatility. It can be pulled behind a tractor or with any of the Red Master harrows for a harrow-roller combination. 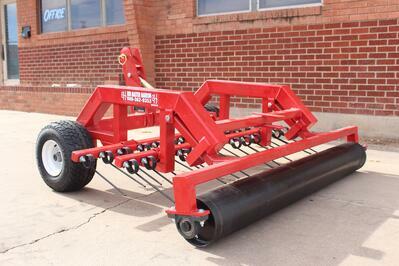 Red Master rollers come in 6-foot, 8-foot, and a special order 10-foot size. Both the Red Master II and the Red Master III are good for dirt, synthetic, fiber and wood arena surfaces; you just need to remove and replace the float pan with the optional paddle wheel to fit different types of footing. The Red Master II and Red Master III include double-braced lift brackets, 4 X 3/16-inch structural tubing, a three-point hitch, reversible teeth, two rows of s-tines, and much more. The Red Master III has a longer frame length to accommodate three rows of s-tines and adjustable tooth depth. To learn more about Red Master Harrow's line of equipment contact us today. Looking for a more cost-effective alternative to buying? We have financing and rent-to-own options available!